Plus Closets is Proud to Announce Our New Color Line-Up for 2017! We have researched current design trends and sourced the latest laminate colors to meet the demands of your customers. Some popular colors have been retained, while other have been retired. Twenty-two exciting new colors have been added to the Plus Closets inventory, increasing our total number of in-stock laminate color choices to forty-five selections. We continue to differentiate ourselves from other closet wholesalers by offering 5 COLORS FOR THE SAME PRICE AS BASIC WHITE. 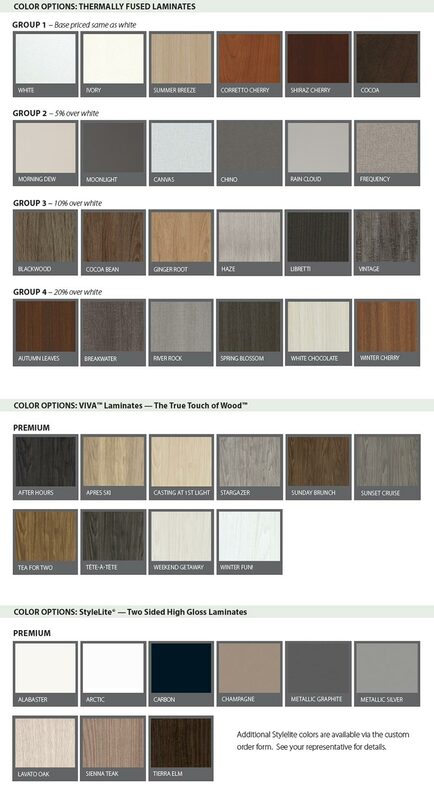 Plus Closets now has 24 standard laminate colors in our line-up. Additionally, we have expanded our premium offerings to include the new VIVA™ line of laminates that includes ten new colors featuring The True Touch of Wood™. This new laminate line mimics the look and feel of real wood, offering the best of both worlds. Samples of all the new colors are available on our Products>Colors web page. Pre-finished plywood veneers will no longer be offered as a stock item. We continue to carry unfinished veneer systems that can be stained or painted to match any color. We also continue to manufacture MDF systems which can be painted to any custom color. Most of the retired colors will continue to be available by special order.